South Africa's convenient Hop-On-Hop-Off Door-To-Door Backpackers Bus Service. Designed for the independent traveller, Baz Bus is a fantastic way to explore South Africa. Baz Bus offers independent travellers and backpackers the opportunity to explore the most beautiful towns and cities in South Africa. All you need is one ticket to your final destination and you can hop on and off as often as you like along the route. We drop you off and pick you up from your backpacking hostel or lodge! There is an amazing variety of backpacker hostels and budget accommodation offered in South Africa and Baz Bus will drop you off at over 200 of them. Baz Bus is for all backpackers and the young at heart. We strive to be an enjoyable and friendly bus company where you can meet great people on the busses and still have the independence to do whatever activities you wish to along the route. With over 40 towns/cities/villages for backpackers to choose from, there will never be a dull moment! 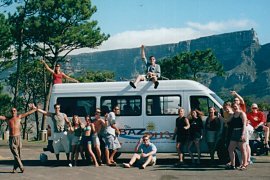 Baz Bus experience can help you become a better beach bum, adrenaline junkie, culture vulture, wildlife fundi, party animal or a bit of all. Baz Bus is completely flexible: You choose where you want to visit and how long you want to stay. There are over 180 backpacking hostels & lodges to select from and more than 40 cities, towns or villages to visit en route. We pick you up and drop you off at your hostel door so you don't have to lug heavy bags between bus and train stations or get lost in strange towns at night and there's no time limit on your ticket! With no time limit on your ticket, you choose the pace. You can travel as fast or as slowly as you like. Sit back, relax and share travel tales with loads of other independent travellers. Private shuttles meet Baz Bus and run you to inaccessible areas. Our 22 seater VW Crafters have trailers so there's plenty of space for people, sufboards and guitars. On a time limit? With the 7, 14 or 21 day Travel Pass you can travel on Baz Bus in any direction you want and as often as you like within the time period. Your Travel Pass starts on the first day of travel and is valid for 7, 14 or 21 consecutive days. This is a great option for those travellers who do not have a lot of time! 1 week pass - option to travel as often as you like and in any direction you want but the ticket expires after 7 days. 2 week pass - option to travel as often as you like and in any direction you want but the ticket expires after 14 days. 3 week pass - option to travel as often as you like and in any direction your want but the ticket expires after 21 days. "Bas Bus is a good option. I was there in December 2010 and ..."
SA-Venues.com is not a booking agent and does not charge any commission or service fees to users of this site. You Deal Direct and Save on your South Africa Tours, accommodation in South Africa and Cape Town Accommodation bookings. Our Editors have selected a set of related pages that may interest you if you are travelling to South Africa. To assist you with making your experience a rewarding one, SA-Venues.com presents a varied selection of ways to experience South Africa.